Last night, I made Fried Green Tomatoes as everyone suggest from yesterday’s tomato hating post. I don’t want to offend any serious fried tomato lovers but I thought they were kinda, blah. Maybe I need a different recipe? I dipped the sliced green tomatoes into a egg/salt mixture and then into a corn meal/paprika/flour batter. I paired them with some spicy arugula and cherry tomatoes from my garden. The arugula had more kick then the tomatoes. I’m not into anything fried expect potato pancakes…I love those. Maybe something spicier? Or maybe a relish? I’ll take a stab at the BLT suggestion tonight. Next year try green tomato pickles. Slice firm green tomatoes thinly, pack into a sterilised jar with lots of sliced garlic, cover with vinegar and olive oil. Its delicious as an antipasto, with a hard cheese like pecorino. I am eyeing off my green tomatoes to do the same thing at then end of my Australian summer. Ok I’m totally trying the BLT sandwich version. It will a great weekend treat. Thanks guys! A local restaurant here serves fried green tomato BLTs. MMMMM. don’t fry them. grill them. just put a little oil on them and grill them up. put them on a burger or a BLT. 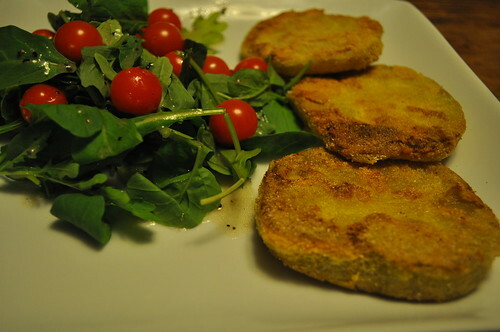 I like my fried green tomatoes with a Greek salad dressing (my homemade version combines red wine vinegar, olive oil, oregano, garlic, thyme, salt + pepper), which adds a little kick. 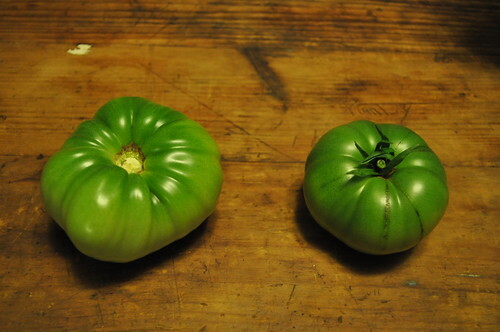 also look up some recipes for green tomato chutney, goes great with lamb or in a veggie or falafel sandwich! Maybe a sour cream or yogurt-based sauce would have helped, balancing the crunch and tartness with a little fat. I like a cilantro tzatziki with them.